“Labyrinth” according to Merriam-Webster, is defined as a complicated irregular network of passages or paths in which it is difficult to find one’s way; a maze. But the labyrinths in my travels are not mazes, but uni-directional paths that offer a very soulful, and some would say spiritual, experience. Labyrinths are said to date back to the Greeks in Knossos where designs started to appear in the 5th to third century B.C. Later, in the 12th century they would start to appear in Europe and elsewhere. From Egypt to India, to the Hopi Mesas, to English village greens, the labyrinth became a world wide architectural and artistic phenomena. Perhaps one of the most famous is at Chartres which measures 42 feet in diameter and whose construction dates to 1201. Labyrinths, often constructed of simple stones, create a path that twists and turns, seemingly doubling back on itself, while always moving forward. 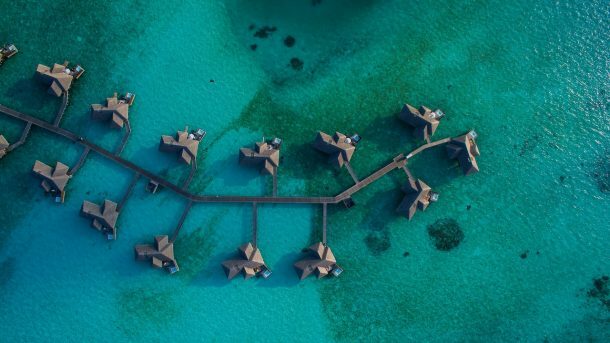 The meandering walkway follows a precise path, offering an opportunity to take a journey within and reflect upon whatever arises. The experience of walking a labyrinth is simultaneously thoughtful and mindless. It is mindless in that you are not required to think, but just to be in the moment and follow the carefully laid out path before you. It is thoughtful in that it is essentially a silent meditation. Walking is a chance to pause, to reflect, to not think if you choose. And in entering this space, time disappears. Here, now, one’s focus is simply on the present. Labyrinth on a Knossos silver coin 400 B.C. 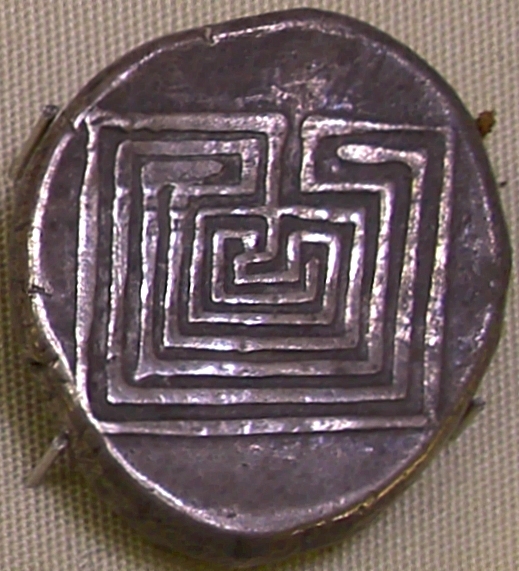 This coin is an example of the seven circuit style, aka the classic labyrinth (versus the Medieval labyrinth). 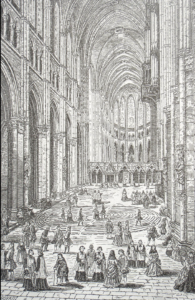 The Medieval pattern was often embedded in church floors such as at the Cathedral at Chartres, and was said to represent the intersection of faith, life and philosophy. Equally puzzling are the labyrinths found carved and painted on cave and temple walls in India and on tribal objects from Sumatra and Java – how and when the labyrinth reached these remote areas remains difficult to fully explain. Likewise the occurrence of the symbol amongst rock art in the American Southwest – was this an independent discovery of the design, or a European introduction? 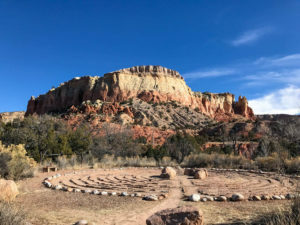 On a recent trip to Ghost Ranch I came upon a labyrinth; and then I met a woman in Santa Fe who was part of the Labyrinth Society. And on this summer day, the Labyrinth Society has a walk at Museum Hill. So I thought I’d attend. Serendipity seems to unfold before me. I walked up to the table where I was greeted. And I got talking to one of the women at the welcoming desk. The woman, it turns out, also had cancer some years ago. “It changed my life for the better,” she confided. I knew what she meant. 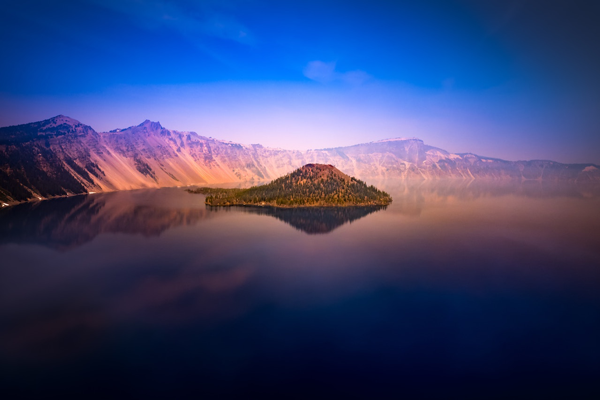 Knowing that one’s time is limited, makes us appreciate the great gift of life. And labyrinths are part of that gift. They are an opportunity to stop, to reflect and to simply be. 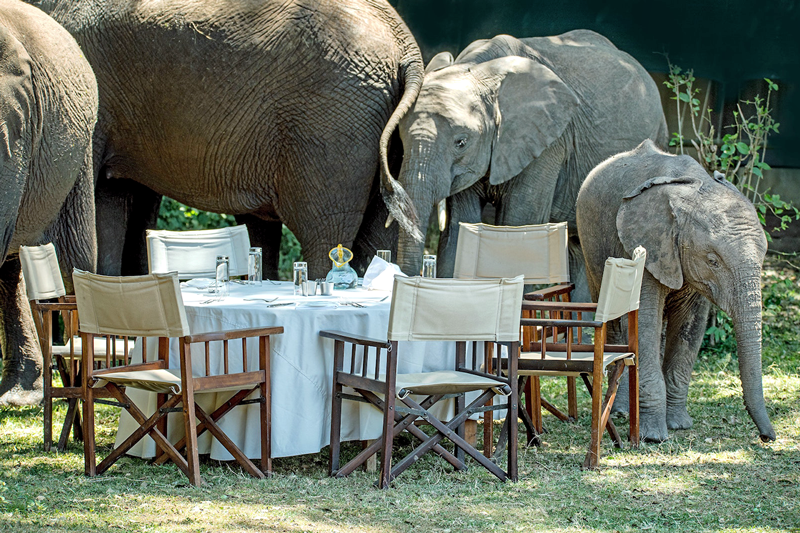 It’s a time out in a busy day. 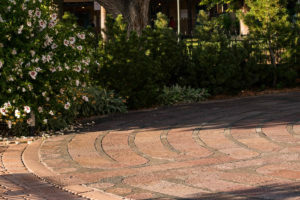 This day at Museum Hill, at mid-day, the leaves tussle in the afternoon breeze carrying the soft melody of the guitar, and twenty people or so slowly weave their way through the green and red pavers of the labyrinth in front of the Folk Art Museum. The Labyrinth Society has an online labyrinth you can “walk” with your mouse. But if at all possible, I suggest you go exploring for a real labyrinth experience. As I got to. 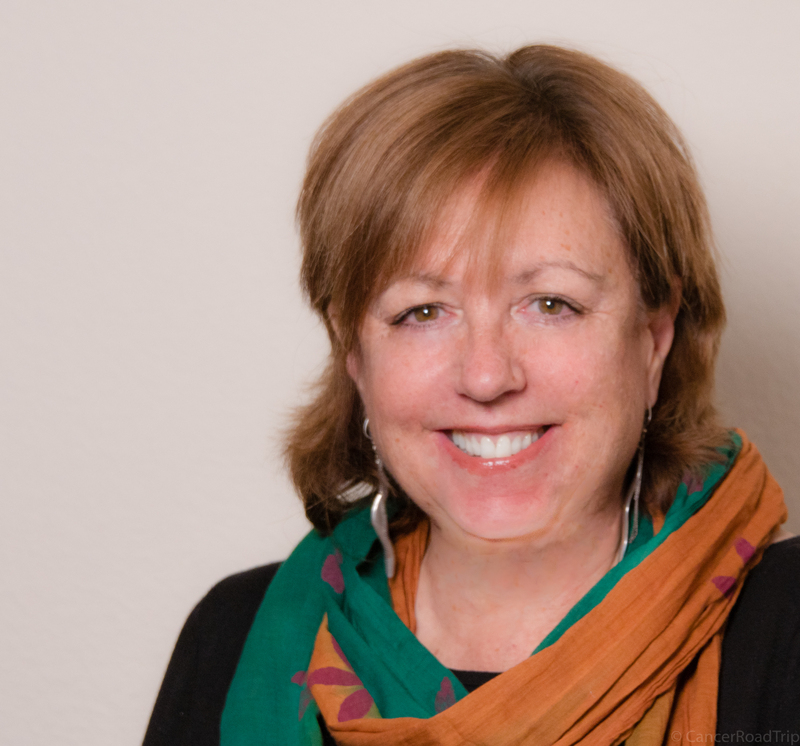 My chance conversation led to a morning with Santa Fe Labyrinth Resource Group founder, Marge McCarthy. 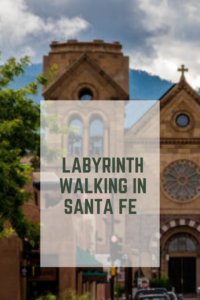 The official list of labyrinths in Santa Fe includes about a dozen different sites. In addition to the public sites, labyrinths can also be found in communities and private yards. Perhaps the most prominent labyrinth is the one at the Cathedral Basilica of St. Francis of Assisi, downtown. 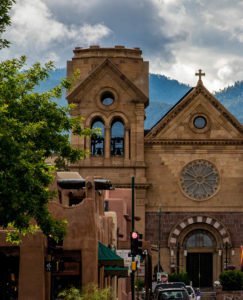 The labyrinth at the Cathedral Basilica of St. Francis of Assisi lies under the left(eastern) bell tower. 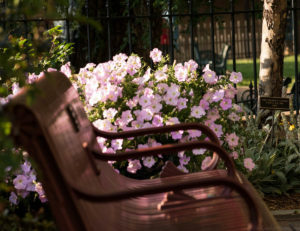 A bench offers a place to pause at the church’s labyrinth. This particular labyrinth is set off to the side so the casual visitor might overlook it. It’s a classic Chartres style labyrinth, that is found throughout Europe, Scandinavia, India and North Africa. Labyrinth historians categorize these circuitous paths based on their shape, the number of circuits and the time period. They can be left handed or right handed; have 7, 9, 11 or more (or fewer) circuits. But all labyrinths have one thing common: the are unicursal, ie. 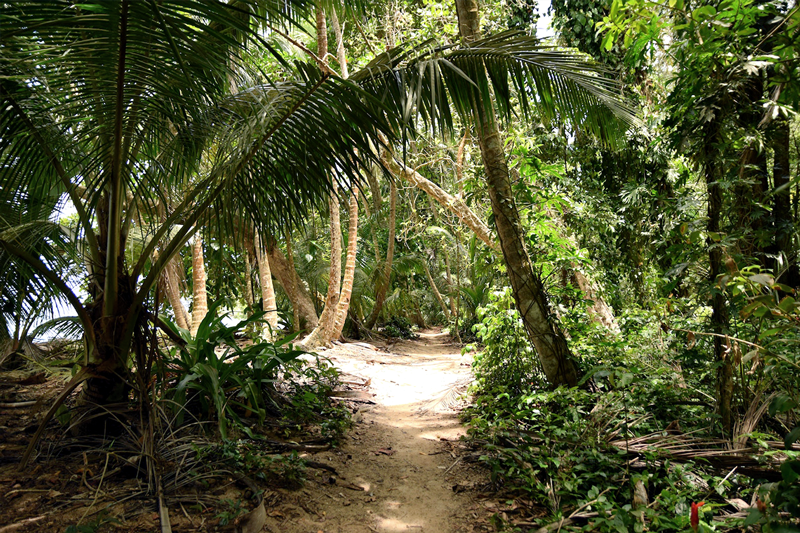 a single path that takes an pre-planned and intricate path into the center and back again. Labyrinth construction varies widely. Some labyrinths are more formal, made of carefully laid stone as part of a plaza. Some are casual, rocks in concentric circles in a field or even ridges of earth. Some are cut into turf. They can be permanent or temporary, as in the case of a labyrinth on canvas. All labyrinths follow basic rules of construction, where the labyrinth is carefully measured and laid out, prior to building. And, according to Marge McCarthy, a dowser should be employed to determine the location and entrance of the labyrinth. Dowsing involves not water, but energy. The person or shaman doing the dousing is seeking to align the energetic center of the labyrinth with the energy of the earth. Marge tells an interesting story of having several dowsers out to a particular labyrinth. And each found the exact same location. Once the center is established, the lines are carefully measured and laid out. Depending on the size of the construction team and location, hours (or even days!) are then spent bringing the labyrinth to life, as the concentric rings are carefully constructed. Exacting measurements at the beginning of the process insure a properly aligned end product. Aldea labyrinth was a community effort. There is something a bit magical about finding a labyrinth where one might not expect it. Who built it? Why here? Every labyrinth has a story. The Frenchy’s Field Labyrinth is made of clay and straw. It requires frequent maintenance. 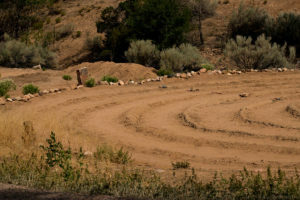 The Santa Fe Interfaith Council sponsored this labyrinth in 1998. This seven circuit labyrinth (there are seven concentric circles, thus a seven circuit labyrinth) is high maintenance. The combination of adobe type materials, hot sun and torrential downpours weathers the ridges that make up the pathways. It’s located in Frenchy’s Field, on Agua Fria which runs along the river. 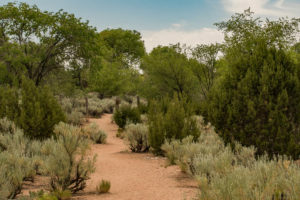 The park has been owned by a host of owners, starting with the Pueblo people and more recently, many recall Frenchy’s Sunshine Dairy, which lent their name to the park. It’s a gathering place for everything from walks along the river, to laughter yoga, to Tai Chi. 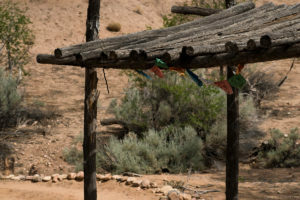 Prayer flags wave from a primitive shelter at the start of the labyrinth. 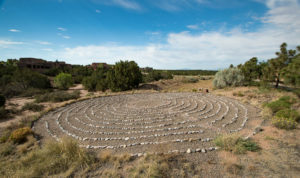 Some of the better know labyrinths around town include the Christ Lutheran Church at 1701 Arroyo Chamiso Road, a modified seven circuit Chartres style; the labyrinth at the Museum of International Folk Art; the Railyard; the Santa Fe Community Yoga Center; Southwestern College and Community Church. There is something magical about coming across a labyrinth in the middle of nowhere. Mind, body and spirit join the earth in a walk as old as the ages. May you discover the wonder of labyrinth walking in your travels. 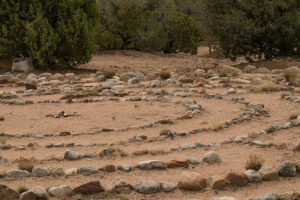 Lauren Artress reintroduces the ancient labyrinth, a walking meditation that trancends the limits of still meditation, and shows us the possibilities it brings for renewal and change. ‘Walking the Labyrinth’ has reemerged today as a metaphor for the spiritual journey and a powerful tool for transformation. 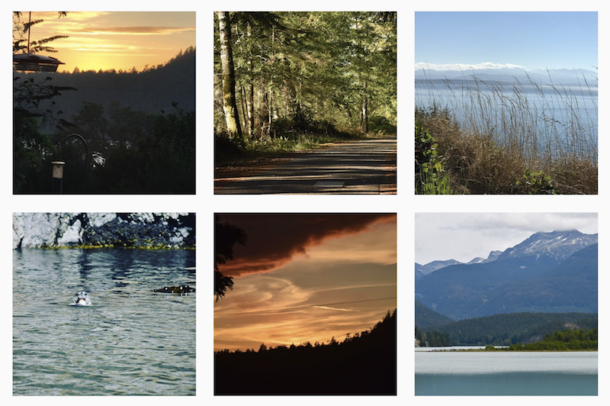 This walking meditation is an archetype, a mystical ritual found in all religious traditions. It quiets the mind and opens the soul. 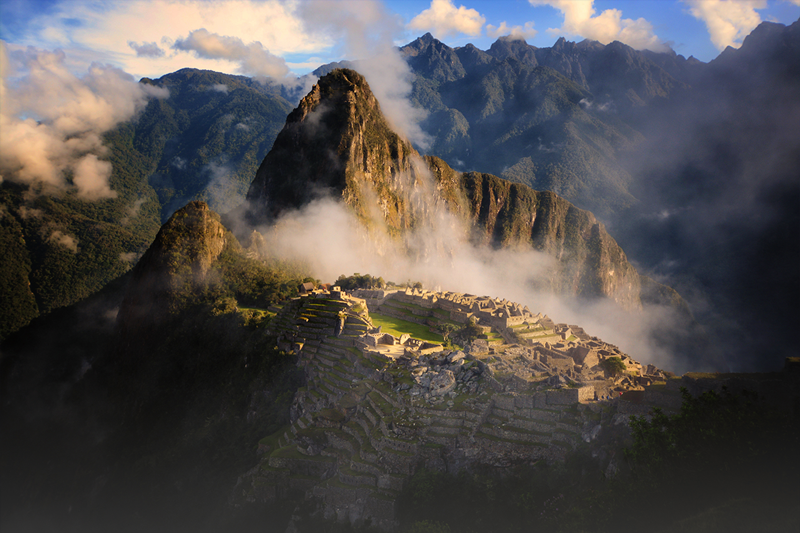 Walking a Sacred Path explores the historical origins of this divine imprint and shares the discoveries of modern day seekers. 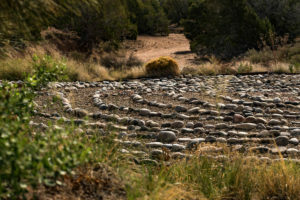 It shows us the potential of the Labyrinth to inspire change and renewal, and serves as a guide to help us develop the higher level of human awareness we need to survive in the twenty-first century. 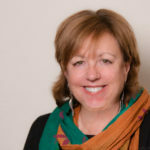 The first time Helen Curry walked a labyrinth she was moved to tears and then “was filled with peace and possibilities.” Here, she shares her years of experience with labyrinth meditation and shows how others can find serenity and guidance by adopting this increasingly popular practice. 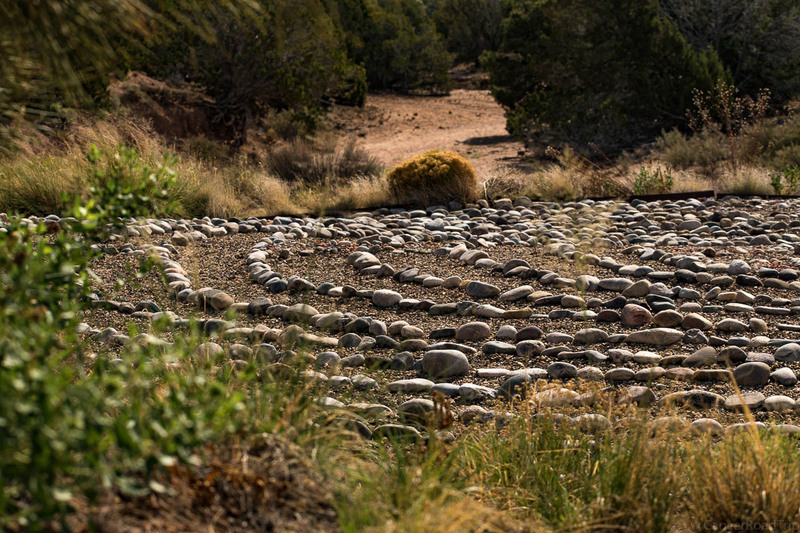 Unlike mazes, which force choices and can create fear and confusion, labyrinths are designed to “embrace” and guide individuals through a calming, meditative walk on a single circular path. 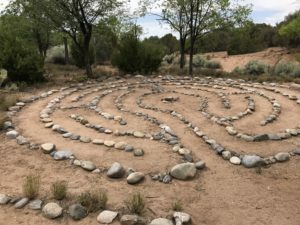 The Way of the Labyrinth includes meditations, prayers, questions for enhancing labyrinth walks, guidelines for ceremonies, instructions for finger meditations, and extensive resources. This enchanting, practical, and exquisitely packaged guide helps both novice and experienced readers enjoy the benefits of labyrinth meditation, from problem-solving to stress reduction to personal transformation. Includes a foreword by Jean Houston, the renowned author and leader in the field of humanistic psychology, who is considered the grandmother of the current labyrinth revival. Laybrinths and mazes are found all over the world and have been a source of wonder throughout history. This work explores the many aspects of labyrinths from their architectural, astrological and mythological significance to their iconographical , mathematical and artistic fascination. It is an introduction to such different labyrinth forms as rock engravings on Trojan castles, medieval manuscripts, church labyrinths and Baroque garden mazes. He traces the origins, developments and changing meanings of this mystic form from the Bronze Age to the present day. The labyrinth’s dominant position in Western civilization is supplemented by explorations in other cultures around the globe, including those of Egypt, India and North America. 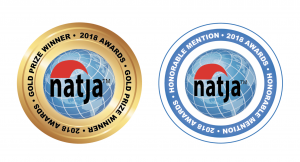 By taking a close look through the centuries at different cultures and across the continents, the cultural and historical significance of the maze takes on a new light. Great article! I think that walking the Labyrinth has been really helpful for me when I am in need of time to sort through a dilemma. I am much better at moving than sitting still and meditating and the labyrinth offers me a way to do both. Thank you for the heads up! I’ll have to check it out.